So things were looking pretty bleak in the garden after the big hail storm, and we have had rain pretty much every single day since, so it has been hard to find a good time to get in there and clean up the mess (and the proliferating weeds). The lettuce and radishes, and many of the other greens as well, took a cue from the stress of hail damage and finally decided to bolt. 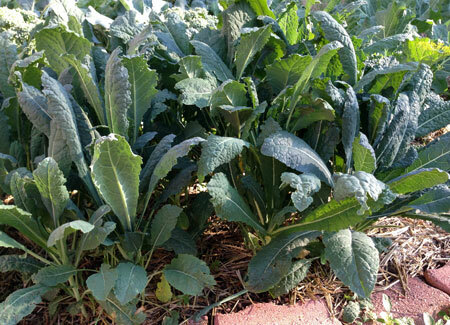 The Tuscan kale is in relatively better shape, and the nice thing about its sturdy foliage is that, even hail-mangled as it was, I was still able to harvest an armload of usable leaves. Hard to tell the difference once it is all chopped up and roasted! I love this sort of throw-as-you-go meal because everything basically just goes right in the oven as soon as you prep it—no fuss and no wasted time, yet with a really well-rounded rounded flavor. If you are efficient about your time management, the entire meal can be on the table in 25 minutes. Theo gobbled down every last roasted grape and clamored for more, and Jeremy said he was “pleasantly surprised” that the salad was cooked instead of raw. Preheat oven to 400F. In a large glass casserole pan or sheet tray, toss grapes with avocado oil to coat, and place in the oven. After 5 minutes, add the kale and onion to the casserole, and toss to coat with avocado oil. 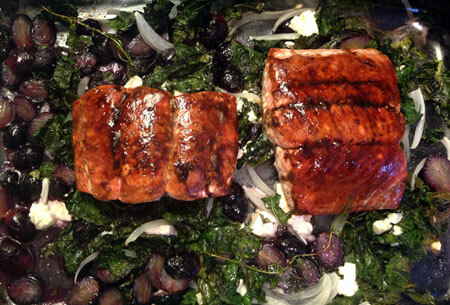 After 5 more minutes, add the feta and toss gently; continue roasting for 10 more minutes, for a total of 20 minutes. Once you get the veggies roasting, season the salmon with salt and pepper. Heat a skillet to medium-high with a splash of avocado oil and the thyme sprigs; sear the salmon skin-side down until three-quarters cooked, then flip and cook the other side briefly. Meanwhile, combine the balsamic vinegar and sucanat in a small saucepan or skillet over medium-high heat and reduce to a glaze consistency. Stir the roasted kale salad and season to taste. Brush the balsamic glaze over top of the salmon fillets, transfer them to the top of the kale mixture, and roast for 5 minutes or until cooked through. Source: Inspired by the Food Network blog and Daydream Kitchen.